Orbital launch rockets burn a massive amount of fuel to place a payload in orbit. Typically around 85 to 95 percent of the total mass at launch is propellant. After subtracting the weight of the vehicle structure, only a small percentage of the total mass is the actual payload that will be delivered to orbit. So even small improvements in rocket efficiency, which reduce the amount of fuel required, will result in large percentage increases in the payload that can be inserted into orbit. Figure 1: A large portion of the total mass of a launch vehicle is propellant. Traditional rocket nozzles are bell-shaped frustums that expand and direct the flow from the engine in the direction opposite to the desired direction of flight. 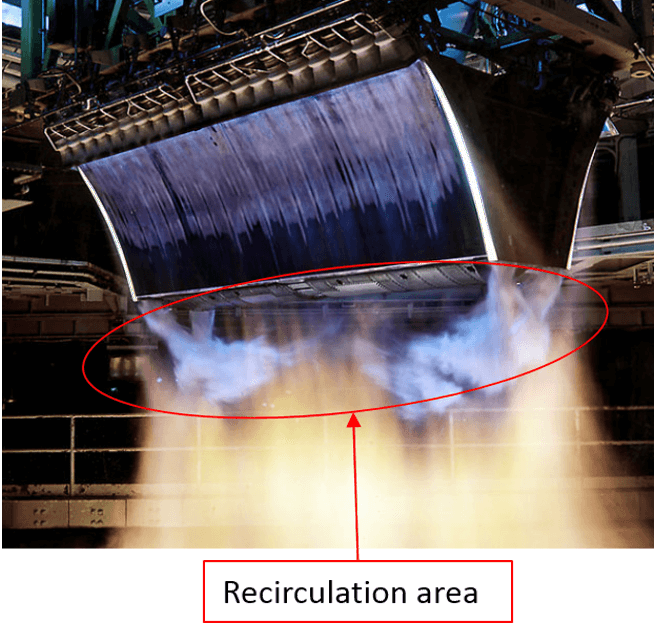 Optimal nozzle efficiency is achieved when the high-pressure exhaust gases from the rocket engine expand enough through the nozzle to exactly reach ambient pressure. In an orbital launch, the ambient pressure starts at or near sea level and then decreases as the vehicle climbs higher into the atmosphere. Thus the nozzle is only operating at optimal efficiency at one point in the ascent. The aerospike nozzle addresses this single optimal operating altitude by expanding the exhaust flow around a conical centerbody. Because the flow is unconstrained on the outside, it is always able to expand to ambient pressure. Typically, the aerospike is truncated before it reaches a point, so there is some flat base area as shown in Figure 2. 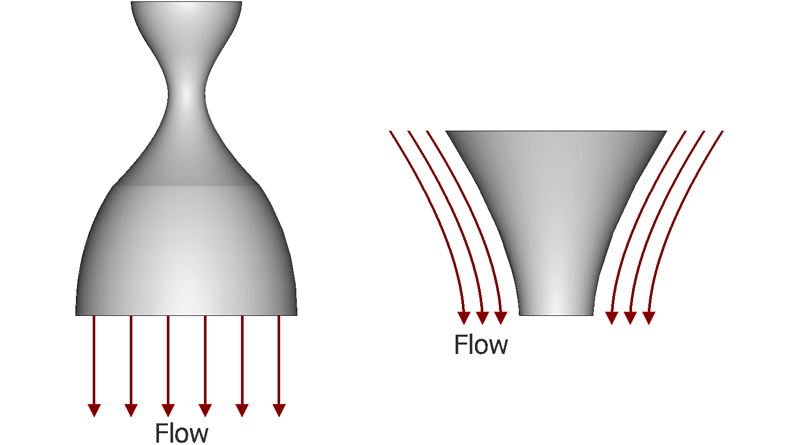 Figure 2: In a traditional bell nozzle (left) flow is internal, while in an aerospike (right) the flow is external. The base area causes a flow recirculation area as shown in Figure 3, which typically is at or slightly below the ambient pressure that causes some performance loss. This loss can be reduced by injecting flow into the base region to reduce the drag and improve overall nozzle performance. The base bleed approach is the focus of the current study. Figure 3: The flow recirculation in the base area of an aerospike nozzle causes some performance loss. The geometry being studied has main toroidal nozzle, a circular cross-section aerospike, and baseplate with circumferential row of circular holes arranged on it as shown in Figure 4. Figure 4: The test geometry has a main toroidal nozzle, a conical aerospike, and a flat base with circular bleed holes. This geometry was tested with various nozzle pressure ratios and bleed rates as reported in Wasko, A., “Performance of Annual Plug and Expansion-Deflection Nozzles Including External Flow Effects at Transonic Mach Numbers,” NASA TN D-4462, 1968. Grids for computational fluid dynamics (CFD) simulations were created in Pointwise. The cylindrical geometry and the square cross-section wind tunnel have a quarter-symmetry, which was used in the mesh generation process so that only one-fourth of the geometry had to be meshed. 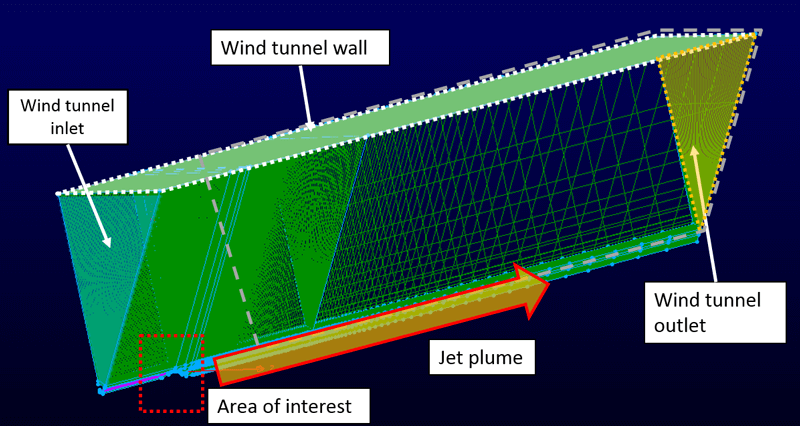 The overall mesh with wind tunnel boundaries and the aerospike test article is shown in Figure 5. Figure 5: Geometric symmetry was used to allow only meshing of one-fourth of the problem domain. Figure 6 gives a closer side view of the mesh around the test aerospike nozzle itself. Comparing this figure and the previous figure we can see that different grid types were used in different parts of the configuration. In the farfield and inside the toroidal nozzle, the geometries are fairly simple and structured grids are used to give high grid quality with a minimum number of grid points. Around the aerospike nozzle and base plate, where the geometry is slightly more complicated due to the bleed hole configuration and transition from cylindrical nozzle to rectangular wind tunnel geometry, T-Rex (anisotropic tetrahedral extrusion) hybrid grids are used with layers of prisms grown in the boundary layer regions and an isotropic tetrahedral grid filling the volume between the T-Rex prism layers and the structured wind tunnel mesh. Figure 6: Grid type was varied depending on local geometric complexity. As shown in Figure 7, the spacing on the structured grids adjacent to T-Rex unstructured grids were set to match the T-Rex spacing, so that grid skewness was kept to a minimum. In the bleed hole passages, a simple O-H topology is used to put structured grids into each passage as illustrated in Figure 8. 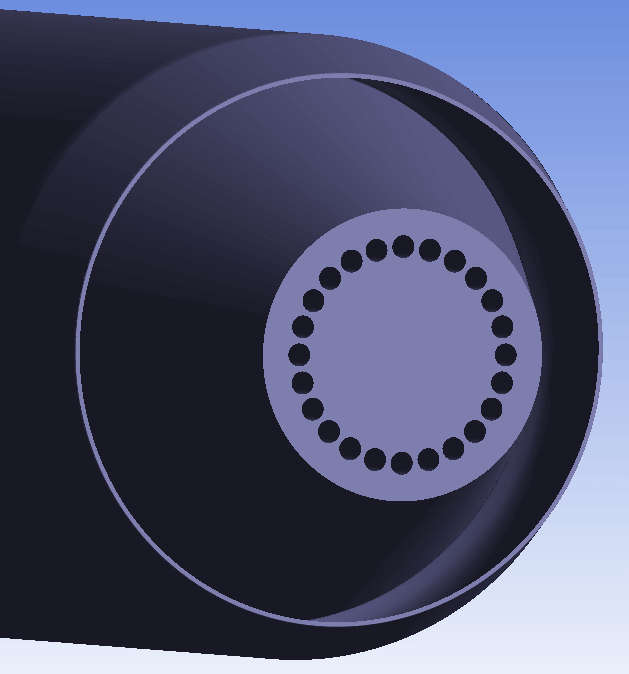 The passage lengths are set to 5 bleed-hole diameters to allow a boundary layer to develop along their length. Figure 7: Care was taken to match grid spacing between the structured and unstructured grids. Figure 8: O-H topology structured grids are used in each bleed hole passage. 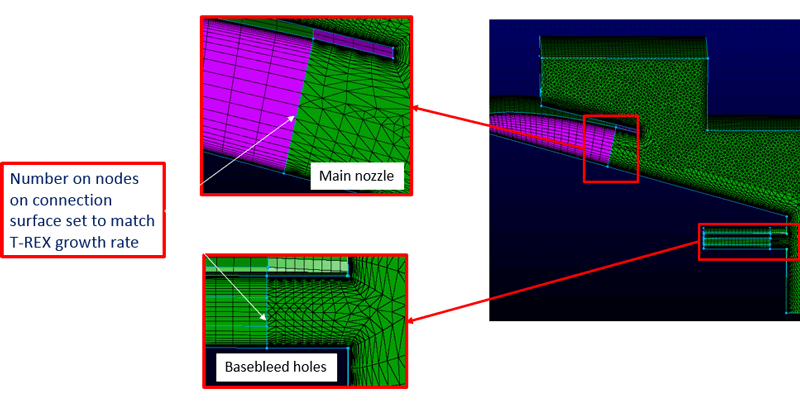 A comparison of experimental and CFD results for nozzle thrust over a range of pressure ratios is shown in Figure 9. This shows a maximum difference between the experimentally measured and computed thrust of around 1.3 percent. 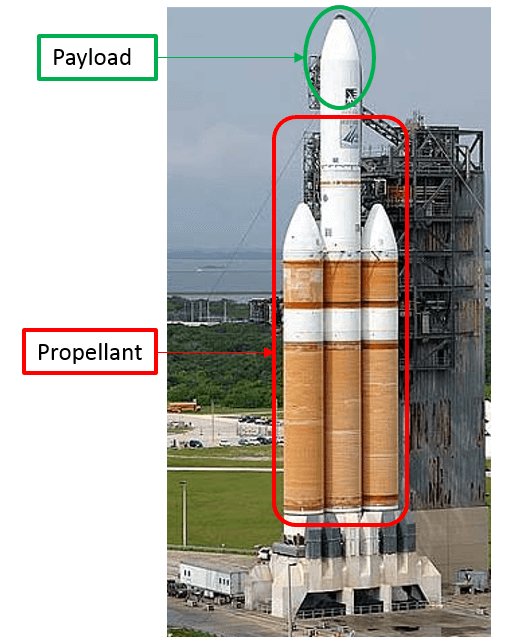 The dashed green line in the figure shows the thrust from a traditional bell nozzle, which gives an idea of the efficiency gains possible from an aerospike nozzle. Next, the effects of flow injection at the base (base bleed) was studied for a nozzle pressure ratio (nozzle total to ambient) of 70. 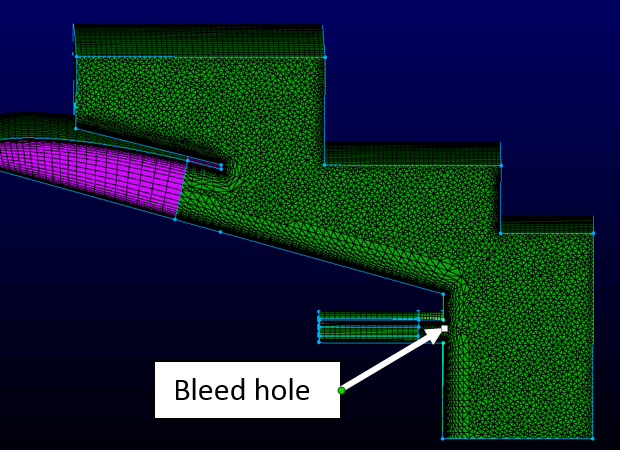 Figure 10 shows streamlines in the base region for different amounts of flow through the bleed holes with no bleed on the left and the highest bleed (7 percent mass flow) on the right. It is apparent that as more flow is added the recirculation region grows longer. 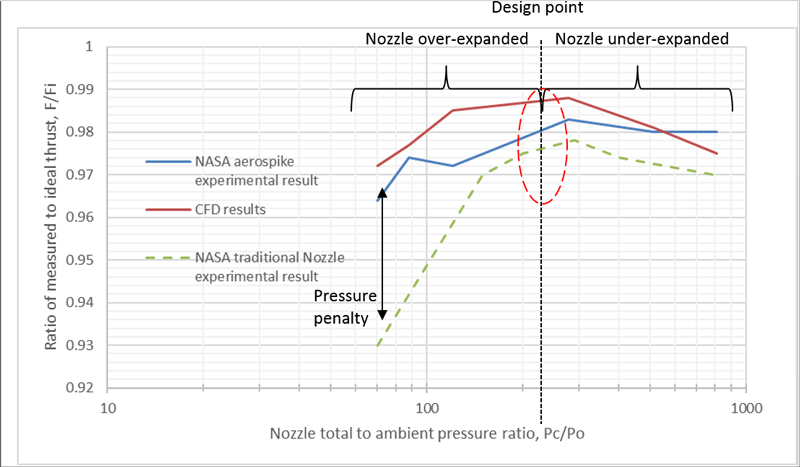 Figure 9: A comparison of nozzle thrust for a range of pressure ratios shows a maximum difference between experiment and CFD of 1.3 percent. Figure 10: Base recirculation changes with added amounts of bleed flow. Nozzle thrust for various bleed ratios is shown in Figure 11 and compared to the wind tunnel results. For this pressure ratio and geometry thrust increases when going from 0 percent bleed to 0.5 percent bleed, but then starts to drop off from there as the amount of bleed flow is increased. 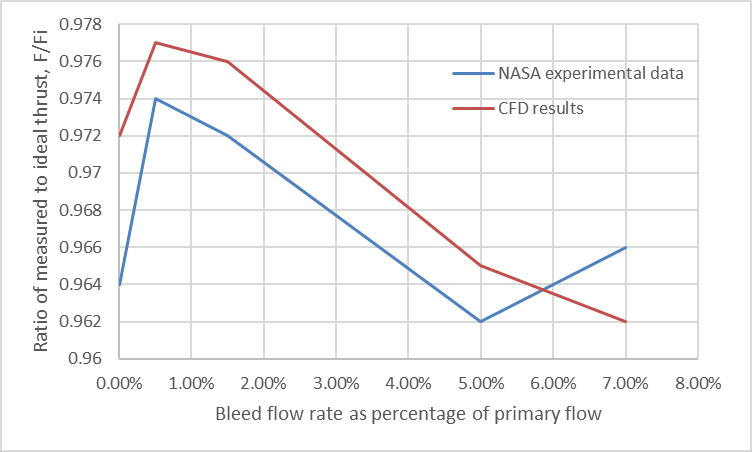 As with thrust variations with nozzle pressure ratio, the CFD predicted thrust trends and absolute values as the bleed ratio varies are in agreement with the experimental values. The amount of bleed required to optimize thrust will vary depending on the geometry of the nozzle and the pressure ratio, but this comparison shows that CFD results can be used to predict optimal flow rates. Figure 11: Thrust increases for small bleed ratios and then drops. CFD tools were shown to be capable of predicting aerospike nozzle performance including the effects of base bleed. Using Pointwise, very good quality meshes can be created in a reduced amount of time – less than half a day for these configurations, and Pointwise makes it easy to optimize the mesh in particular areas of interest in the flowfield. Note: This work was originally presented at the Pointwise User Group Meeting 2016 in Fort Worth, Texas.